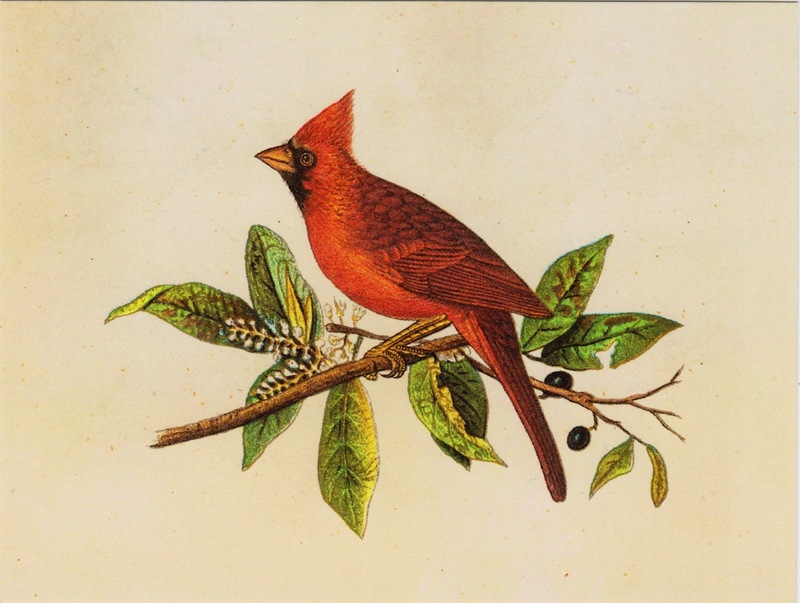 Postcard US-2995481 to Poland shows a vintage cardinal song bird illustration from the 1800s. Known as the redbird or common cardinal, the northern cardinal (Cardinalis cardinalis) is in the genus Cardinalis and can be found in woodlands, gardens, shrublands, and swamps from southern Canada, the eastern United States from Maine to Texas, to Mexico. The bird has a distinctive crest on the head, and a black mask on the face for the male and a gray mask for the female. According to Wikepedia, "the male is a vibrant red, while the female is a dull red-brown shade. The northern cardinal is mainly granivorous, but also feeds on insects and fruit. The male behaves territorially, marking out his territory with song. During courtship, the male feeds seed to the female beak-to-beak. A clutch of three to four eggs is laid, and two to four clutches are produced each year. It was once prized as a pet, but its sale as a cage bird is now banned in the United States by the Migratory Bird Treaty Act of 1918." The card was purchased from Zazzle.